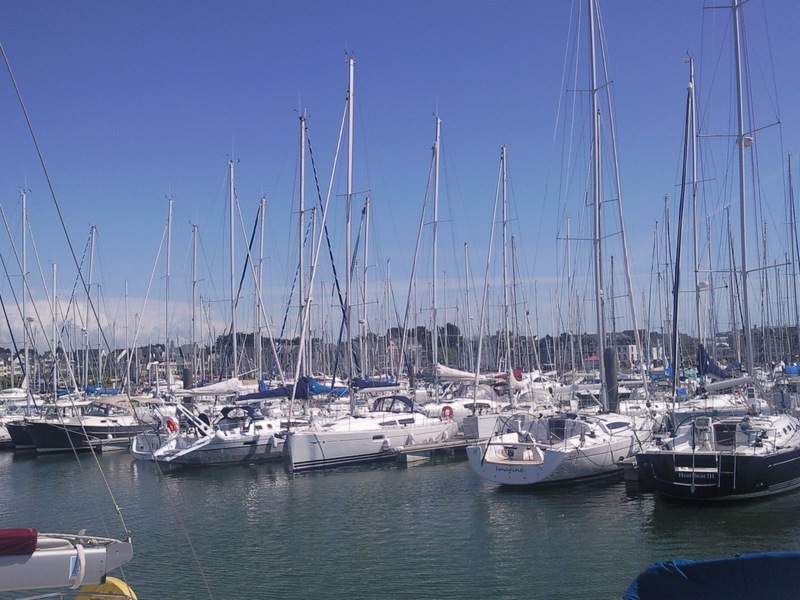 Two weeks ago I had my first experience of sailing. 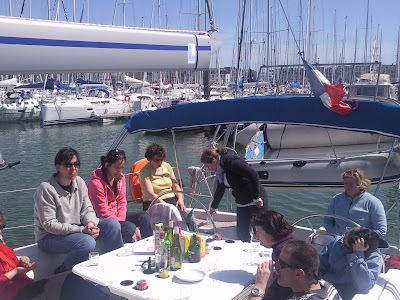 Friends from the Choeur Varenne had organized a sailing week end in Britanny. I joined a party of ten living on board a sailing boat. 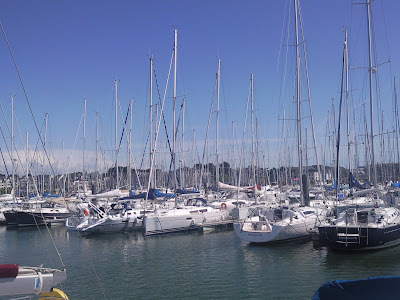 I did enjoy the sailing but as this blog is devoted to food and music, I will delve on those aspects of this trip. As all the crew members were part of the choir, when bad weather struck we whiled it away singing or listening to the piece of our next programme. It is very tight on board so every thing is optimized to save space, including the kitchen and dining tables. 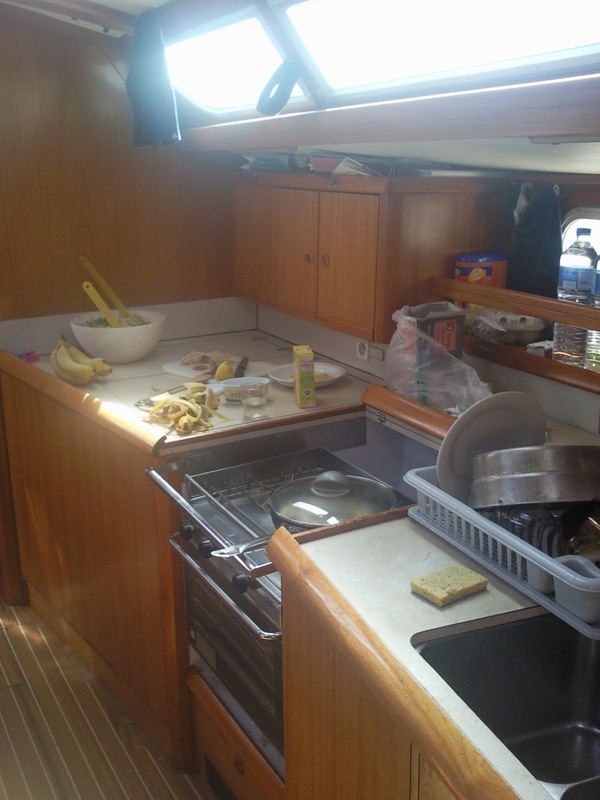 When in sailing mode under strong wind the boat can tilt to up to 45°, so all objects have to be secured in cupboards, store rooms or inside the two deep sinks. Otherwise, things just fly off the shelves and break on the floor. We came back to port with one plate broken on our first day because newcomers like me were not aware of the shifting horizontality on board. One of us had left a plate on the kitchen table. I was delighted to notice that I did not get seasick. I could actually widstand the to-and-fro tilting while reading, sleeping and even preparing food inside the cabin. I have also learned how to get organized to prepare complete meals for ten using only two hot plates, a small oven and a very small and unstable working space. One must pay particular attention to one's fingers when cutting food on board a boat that is sailing. The trip organizer had prepared a detailed menu for all the meals of our four days on the boat but our crew quickly decided we would not follow the menu to the letter, prefering to be inventive with the ingredients available in the store rooms and refrigerator. There was a generous provision of Muscadet white wine, which did not seem to tempt diners, so I used a lot of it for sauces to accompany the meats. The crew also made a particular effort to arrange the fruits available into fresh fruit salads rather than opening the tinned fruit salads. For our last dessert on board, I fried the leftover bananas in salted butter caramel. Our captain was particularly grateful to have a chef to prepare the food so that meals could be ready very soon after the boat had been moored. I must admit that I enjoyed more being in control at the stoves than clumsily trying to help out during manoeuvres in the ports. I have mentioned space was tight on board. 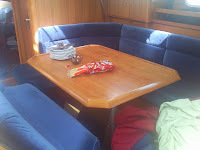 Our dining table was also the bed I shared with another crew member. The table feet could be removed and two planks set on which to lay the table. Cushions then completed the transformation of the dining table into a large bed.